Post: Gaurav Akrani. Date: 7/28/2010. Comments (2). Label: Management. It is necessary to have brief understanding of three terms intimately connected with the concept and process of delegation. These terms are: 1) Responsibility, 2) Authority, and 3) Accountability. Responsibility indicates the duty assigned to a position. The person holding the position has to perform the duty assigned. It is his responsibility. 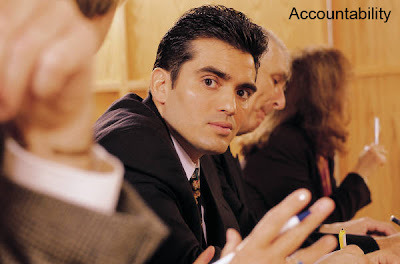 The term responsibility is often referred to as an obligation to perform a particular task assigned to a subordinate. 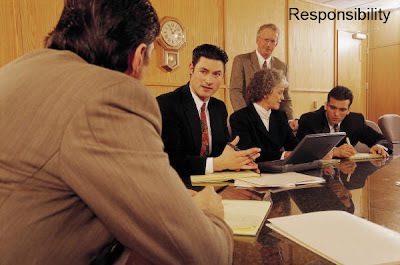 In an organisation, responsibility is the duty as per the guidelines issued. According to Davis, "Responsibility is an obligation of individual to perform assigned duties to the best of his ability under the direction of his executive leader." In the words of Theo Haimann, "Responsibility is the obligation of a subordinate to perform the duty as required by his superior". McFarland defines responsibility as "the duties and activities assigned to a position or an executive". The essence of responsibility is the obligation of a subordinate to perform the duty assigned. It always originates from the superior-subordinate relationship. Normally, responsibility moves upwards, whereas authority flows downwards. Responsibility is in the form of a continuing obligation. The person accepting responsibility is accountable for the performance of assigned duties. It is hard to conceive responsibility without authority. Authority is the right or power assigned to an executive or a manager in order to achieve certain organizational objectives. A manager will not be able to function efficiently without proper authority. Authority is the genesis of organizational framework. It is an essential accompaniment of the job of management. Without authority, a manager ceases to be a manager, because he cannot get his policies carried out through others. Authority is one of the founding stones of formal and informal organisations. An Organisation cannot survive without authority. It indicates the right and power of making decisions, giving orders and instructions to subordinates. Authority is delegated from above but must be accepted from below i.e. by the subordinates. In other words, authority flows downwards. According to Henri Fayol, "Authority is the right to give orders and the power to exact obedience." According to Mooney and Reily, "Authority is the principle at the root of Organisation and so important that it is impossible to conceive of an Organisation at all unless some person or persons are in a position to require action of others." Every employee/manager is accountable for the job assigned to him. He is supposed to complete the job as per the expectations and inform his superior accordingly. Accountability is the liability created for the use of authority. It is the answerability for performance of the assigned duties. According, to McFarland, "accountability is the obligation of an individual to report formally to his superior about the work he has done to discharge the responsibility." When authority is delegated to a subordinate, the person is accountable to the superior for performance in relation to assigned duties. If the subordinate does a poor job, the superior cannot evade the responsibility by stating that poor performance is the fault of the subordinate. A superior is normally responsible for all actions of groups under his supervision even if there are several layers down in the hierarchy. Simply stated, accountability means that the subordinate should explain the factors responsible for non-performance or lack of performance. They need proper consideration while introducing delegation of authority within an Organisation. In the process of delegation, the superior transfers his duties/responsibilities to his subordinate and also give necessary authority for performing the responsibilities assigned. At the same time, the superior is accountable for the performance of his subordinate. It saddens me to think that India may follow the West in preaching and pursuing the foolish "accountability culture" which has plagued so many nations over the past 30 years. This culture has robbed companies and agencies in the West of the creative vitality of their workforce, replacing it with a mass of drones whose main focus is on checking endless check-boxes on accountability paperwork to give the illusion that they are being productive and fulfilling the objectives and targets set for them. In reality, an enormous amount of creative and productive energy and resources is spent on pointless and meaningless accountability tasks, while real human relationships, the use of sound common sense and actual productivity languishes. The saddest part of all this is that many younger members of the human capital of so many companies and organizations believes (1) that it has always been this way, and (2) that something real is actually achieved by all this endless form-filling and busy-work. I believe that this culture will result ultimately in the death of Western culture as it engenders a sense of futility and meaninglessness in its participants, consumes so much and diverts from what is real. I challenge the people of India not to pursue this same course, but to find more real and effective ways to manage their enterprises. It is already too late for us in the West, but if you learn from our experience you can save yourselves. No empire lasts forever, and the empire of the West has seen its best times. It will be interesting to see what follows as the next phase of world history. Thank you for the informative, clear, comprehensive and interesting write up.